I have issues with tinctures because I cannot metabolize alcohol, so even a few drops of tincture of any kind, can make me a little high. However, its a very effective way to preserve the medicinal value of plants. That being said, I’ve begun to realize how strong you really have to make tinctures to make them effective. My first tincture was a dandelion tincture. Looking back on it, i realize I did not make it strong enough at all. According to Green’s book, for fresh plant material you take the amount of material you have in grams and multiply that number by two and that is how many mL of ethanol you have to use. 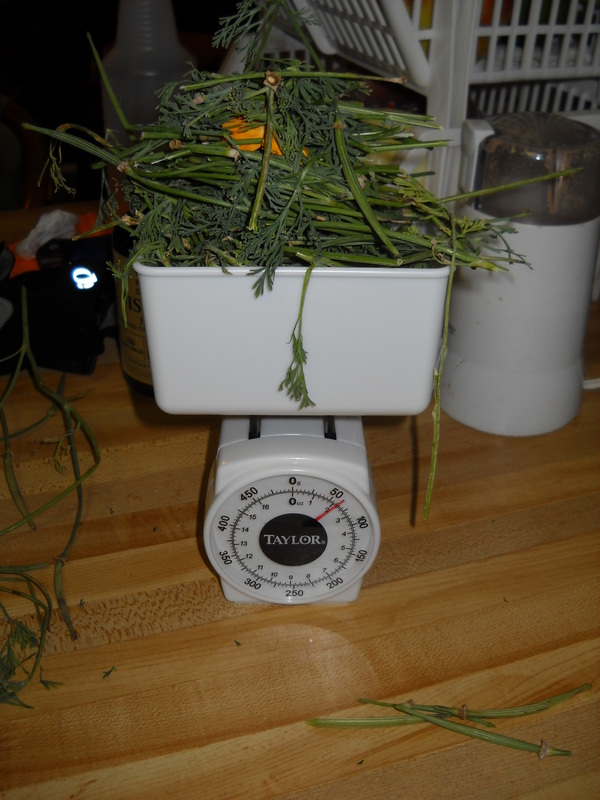 So for example, I brought home a large amount of California Poppy from the garden I volunteer at, and I put aside about 70 grams of it for the tincture. This mean I needed 140 mL of ethanol. When I put those amounts in the blender, the plant material reached to the top of the blender while the alcohol barely filled in the bottom of the blender jar. I had to blend and push down the plant material until it was all very well compacted. Another way to do it is to fill a jar to the top and very packed with your plant material and then fill the rest with ethanol. Blending it is better because you expose much more surface area of your plant material to the ethanol and so extract more medicinal value from it. If you don’t have a blender you can just chop it as fine as possible. California poppy is related to the infamous Opium Poppy, and while it can have many of the same effects on the human body, it has none of the negative effects so its a very interesting alternative to pharmaceutical analgesics. I made the tincture the other day and have the jar tightly capped sitting on top of my fridge. That way I see it every day and remember to shake it. I have to keep it like that soaking for 2 weeks and then i can strain it and try it. I’ll let you know how it works! I just made my 2nd batch of CA Poppy tincture – 1st batch was made in late spring so was mostly sort leaves & stems & buds & roots. I just decanted it today after 7 weeks of sitting JAMMED in the wide mouth quart jar in 40 proof vodka. Today, 7 weeks later, I’ve put up “mature” plant – largely pods & roots, w/few flowers & leaves. The stems were so twig-like I discarded them – which was the time-consuming part of this endeavor – separating stems out from the rest. The hard part of making the young tincture was washing all the mud off. I’ve been trying to find on-line information on the relative strengths & effects of age & the different parts of the plant. I’ll see what I see! Thank you for your Internet site. CA poppies and opium poppies are NOT related. There are however alkaloids in CA poppies that can affect one in some mildly similar ways. 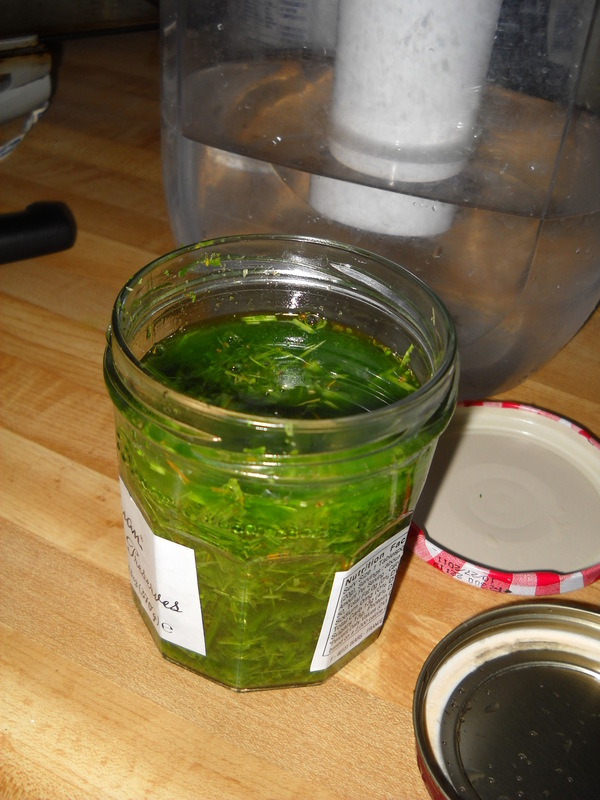 You might want to investigate making tinctures with vegetable glycerin instead of alcohol given your sensitivities. How did it turn out? I am interested in tincturing California Poppy for its use as a mild sedative and sleep aid.